11,507 others viewed this post. The clouds parted! It’s a miracle! In the secular, that-seemed-unlikely kind of way. But I don’t want to talk about the weather, I’m not a farmer, just an astronomer with some pent up, astrophysical energy that needed release. This is m45, the Pleiades aka The Seven Sisters aka The Subaru logo taken over 2 nights with 2 hours in mono (black and white) and 2 hours in natural colour using 1 and 3 minute exposures respectively with the Celestron RASA and Celestron CGX mount. Unlike most other nebulous regions, this cluster of stars simply illuminates the dust and gas instead of the dust and gas glowing itself in brilliant red/pinks. This gives it a beautiful crystal blue. Processing notes for dorks – The diffraction spikes are pretty kooky. 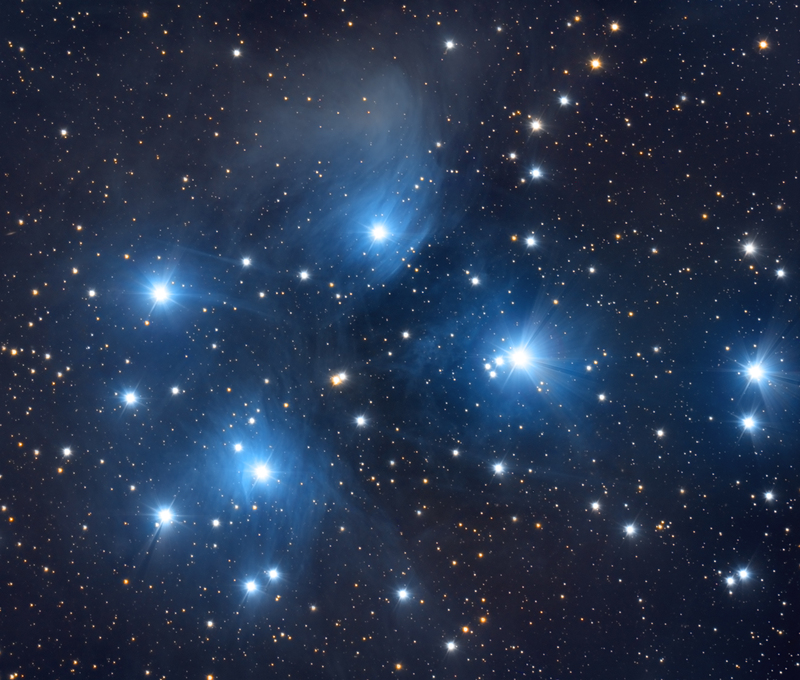 They seem to flare in various directions, which is typical for bright stars around a frame and a reflecting telescope. I exacerbated the flares with cross beams of wool obstructing the scope. I don’t normally do this but cluster type regions with bright feature stars look ok with them. It’s a tight crop so a bit smaller region than the full focal length of the RASA/8300-chip combo allows, but cropping is a lazy astronomers best friend! The base photoshop layer is mono/qhy9 data and the layer above is colour/qhy12 data with the blending mode set to colour. Calibration and integration in PixInsight first.